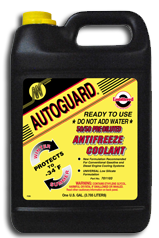 AUTOGUARD Antifreeze & Coolant is a conventional (green) ethylene glycol base coolant for both automotive aluminum block engines and low silicate light-duty diesel engines. 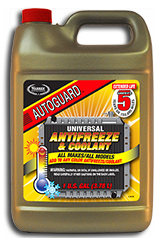 AUTOGUARD Antifreeze & Coolant is compatible with all conventional green antifreeze. AUTOGUARD UNIVERSAL EXTENDED LIFE Antifreeze is recommended for use in all makes and models of foreign and domestic passenger vehicles and light duty trucks. It contains a proprietary formulation of premium corrosion inhibitors that provide extended protection against rust, corrosion and pitting caused by cavitation for all coolant system metals. AUTOGUARD - READY TO USE (RTU) Antifreeze/Coolant is a 50/50 mix of conventional (green) ethylene glycol base coolant for both automotive aluminum block engines and low silicate heavy duty diesel engines. 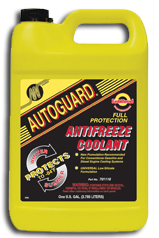 AUTOGUARD 50/50 Antifreeze & Coolant Protects all cooling system parts including aluminum and modern high lead solders. 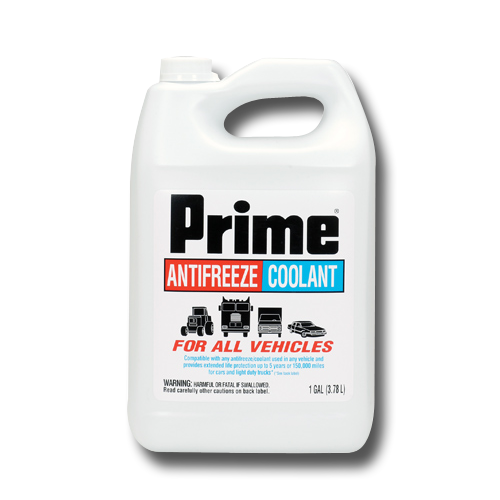 Prime Antifreeze and Coolant, a product of Prestone, is compatible with any antifreeze/coolant used in any vehicle with aluminum and other engine metals. Meets or exceeds ASTM D3306 and D4985 for corrosion protection against all metals, including aluminum, while providing freeze-up and boil over protection. 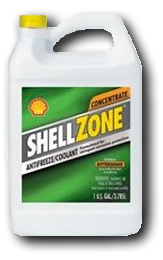 Shellzone Antifreeze is a high quality, single phase, ethylene glycol based antifreeze. It is a low silicate, all-purpose coolant designed for use in both automotive and heavy duty diesel engines (with the use of SCA�s). Shellzone Antifreeze is specially formulated to meet the stringent aluminum corrosion protection requirements of today�s automotive engines. 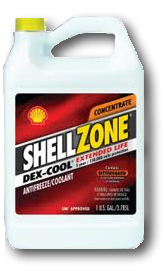 Shell DEX-COOL Extended Life Antifreeze/Coolant is a single-phase, ethylene glycol based, extended life, universal automotive engine coolant based on a unique extended life carboxylate inhibitor system. Shell DEX-COOL is suitable for a five year or 150,000 mile service life in automotive applications. It meets GM6277M-General Motor�s Extended Life Coolant specification and will provide effective, long term corrosion protection for critical engine metals. Shell Rotella Extended Life Coolant (ELC) Antifreeze is designed to go 600,000 on-highway miles and provide overall reduction in cooling system maintenance. It also offer complete cooling system component protection by helping to reduce water-pump failures, hard-water-scale deposits and silicate gel. Protection against overheating � Excellent heat transfer properties allow heat to transfer more effectively. 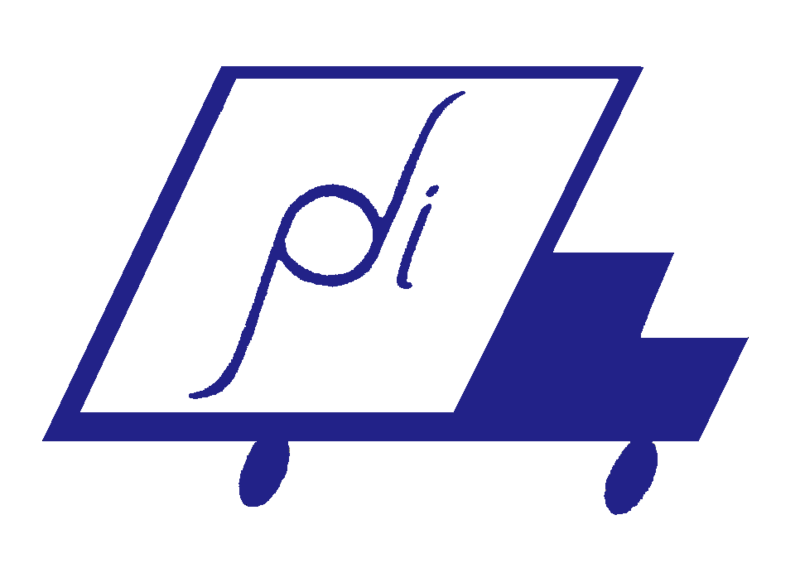 Corrosion protection � Corrosion inhibitor technology protects metals against all forms of corrosion. Maintenance savings � Technology helps extend coolant life and prolong the life of seals, hoses and other cooling system components.